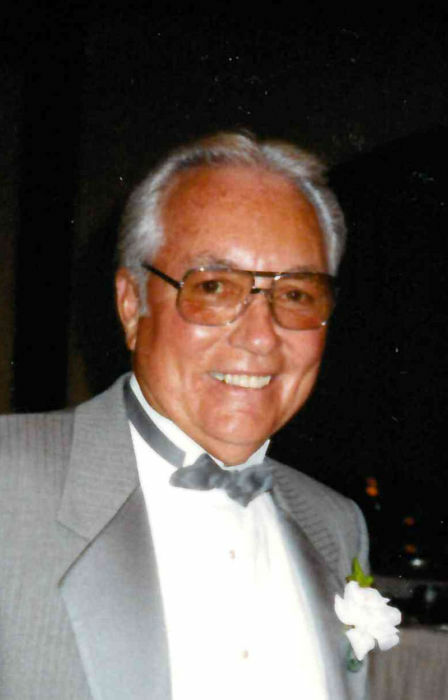 Howard L. Dew, age 91, of Osage Beach, MO, formerly of Belleville, IL, born on December 5, 1927 in Kilbourne, IL, passed away at his home of nine years, NHC Osage Beach Rehab and Health Care Center on Saturday, March 16, 2019. Howard was owner and president of Ring-Wil Insurance Agency, Belleville, IL. He was a veteran of the Korean Conflict, a member of various civic organizations, and a former member of Christ United Methodist Church of Fairview Heights, IL. He loved the Lord and reminded us daily to give thanks to the Man upstairs. He was an avid outdoorsman; fishing was his hobby, and golf was his passion. He earned the title, Mr. Bass of the Year, two times, as a member of the Illinois Bass Anglers Association. Howard registered six holes-in-one, and at the age of 72, shot a 72 at a pro course in Arizona. He entertained family and friends alike by singing and playing the guitar and piano. He was a generous man who lived life to the fullest. He was an amazing husband, Dad, Grandpa, and Great Grandpa. He was free with his hugs, kisses, and “I love you’s,” and he never met a stranger. He loved and was loved by his nursing home family and entertained them until the end. Family and friends counted on his fearless optimism, his generous spirit, quick wit, and memorable one liners. Howard was preceded in death by his parents, Paul Velores and Grace Pauline, nee Bahl, Dew; his beloved first wife, Barbara H., nee Staber, Dew, whom he married July 16, 1949 in Springfield, IL and who died October 1, 1994; his second wife, Leveda M., nee Bateman, Dew, whom he married December 13, 1997 in Eldon, MO and who died December 14, 2018; his two sisters, Yuvonne Combs and Lela Mae Liescheidt; and his brothers-in-law, sisters-in-law, one niece, and one nephew. He is survived by his two loving children, Sally (Michael) Wondolowski of Shiloh, IL and David (Rita) Dew of Osage Beach, MO; his two wonderful grandchildren, Amy (Tim) Neff of Waterloo, IL and M. Justin Wondolowski of Shiloh, IL; his four adoring great grandchildren, Braden and Ryder Neff and Sophia and Ava Wondolowski; and his dear nieces, nephews, friends, and Leveda’s family, whom he embraced with open arms. Our family wishes to thank the Osage Beach Rehab and Health Care Center for their outstanding and compassionate care. Your love for him was endless, and we will never forget. In lieu of flowers, donations are preferred to the Alzheimer’s Association, Hospice Care of Osage Beach, MO, or the organization of your choice. Visitation will be held on Saturday, March 23, 2019 from 10:30 A.M. to 1:30 P.M. at Kassly Mortuary, Fairview Heights, IL. Funeral services will be held at 1:30 P.M. on Saturday, March 23, 2019 in the Kassly Mortuary Chapel, Fairview Heights, IL. Interment will follow at Lake View Memorial Gardens, Fairview Heights, IL.